Good Smile Company and Max Factory start things off right with the Nagato figma. She comes with a ton of accessories, as shown here. 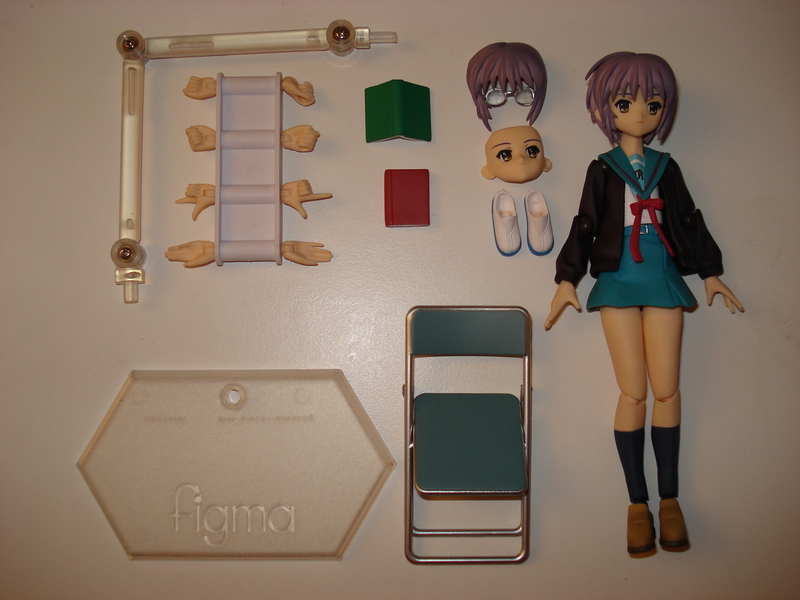 As usual, the standard set of figma hands (for a non-Lucky Star and non-male figma that is) which include an outstretched palm (attached to the character in the box,) a closed finger palm, a pointing finger, a closed fist, and a fist with a hole in it for figma accessories (such as swords, staves and other weapons.) Another staple of the figma line is the three-jointed figma stand and base. 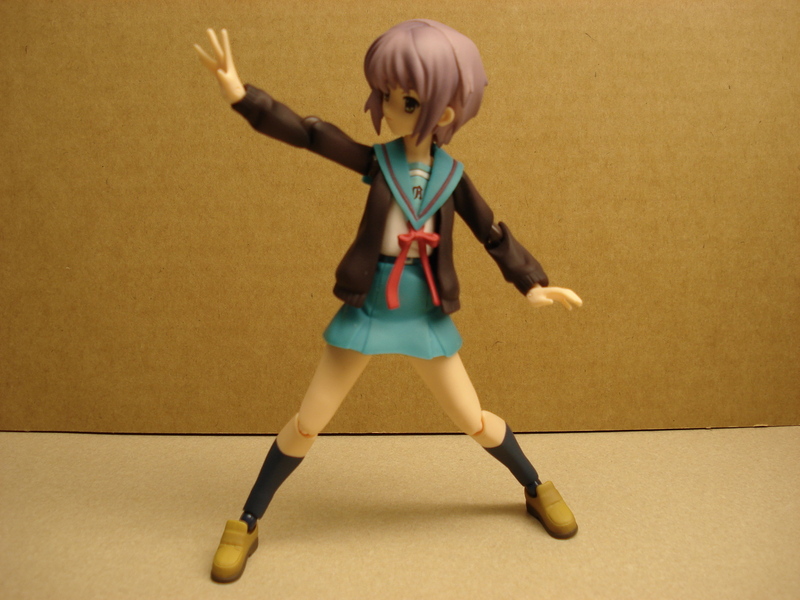 Nagato also comes with indoor shoes with a blue sole for first year students, an alternate face with Nagato looking slightly to the left, and a replacement for her bangs with glasses attached. 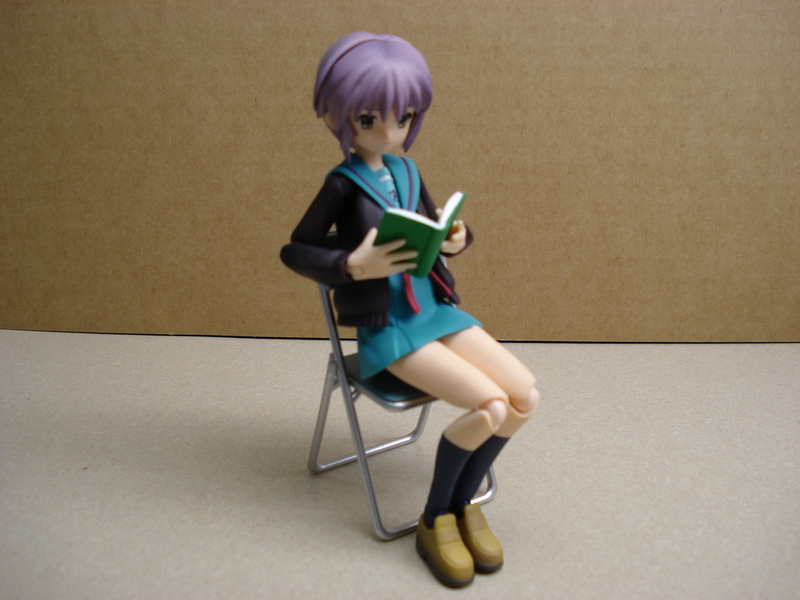 Nagato comes with 2 types of books, one open for reading and one closed for holding. 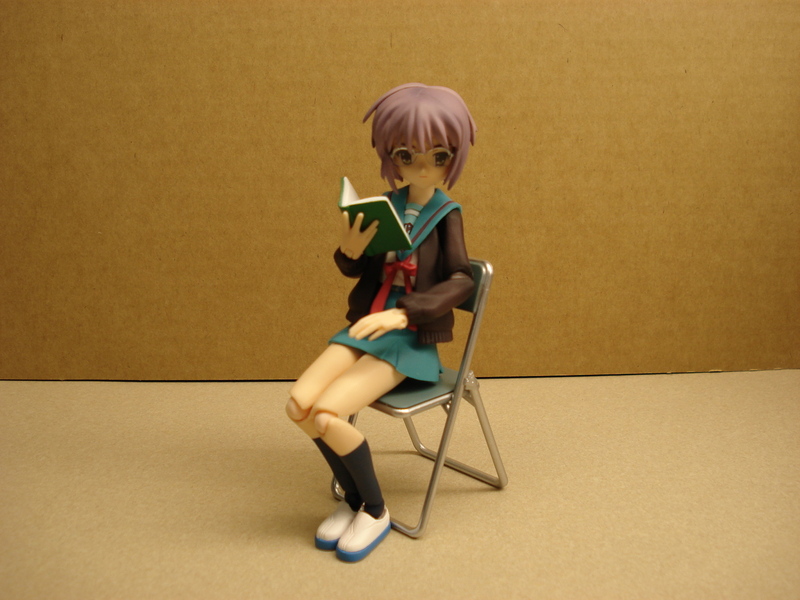 Lastly, this figma comes with Nagato’s trademark folding chair that she is often found sitting in reading books. All of these awesome accessories fit nicely in the figma bag that comes with every figma that I’ve seen except for Chou Yuusha Haruhi, making transportation of your beloved figure easy and manageable. Cons: The book accessories are kinda a pain in the arse to get her to hold, as they aren’t linked to her hands and are loose. Once you get them in position though, they look fairly nice. The extra face that she comes with is only very slightly different from the one she comes with. Also, as is with all figma straight out of the box, swapping the hands can be a bit of a chore until you’ve done it a few times to loosen the hole. You still want to be very careful, because it is known that the small ball at the end of the joint CAN snap off if you’re not careful. I’m a bit miffed that the cardigan isn’t removable (her arms are painted the color of the cardigan,) but when I get the witch version of Nagato, she comes with the cloak, so Nagato has to remove the cardigan in order to incorporate the cape. 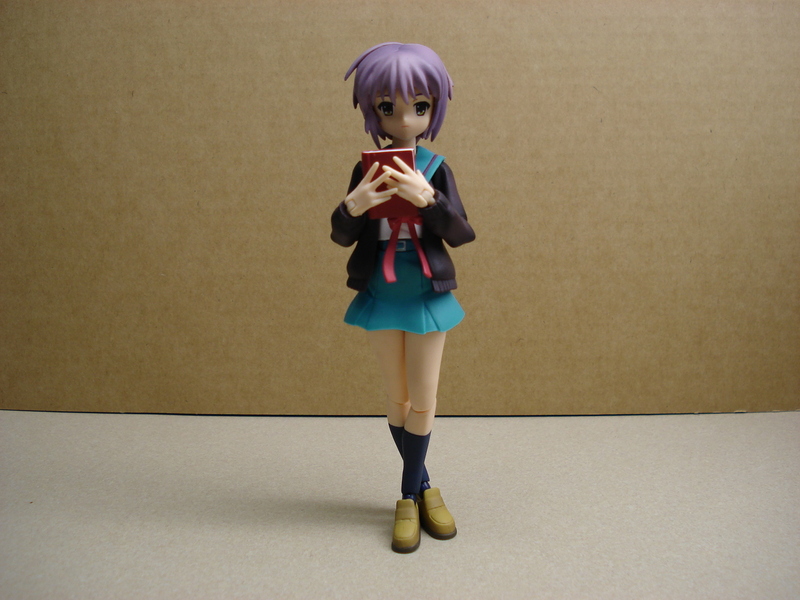 Nagato is definitely a great first figma for me. She is currently available at most online stores for around $25-30. Put her on your list if you plan on purchasing the rest of the SOS-dan!